Rose water is magical water! Rose water and its benefits were often told to us by our moms and Of late I have been hearing and reading a lot about the benefits that this magical water has for your skin over other chemical based products. And so I finally decided to try and buy Fabindia’s facial rose water. The reason as to why I Picked FabIndia over other brands available in the market is that this product is a totally natural product free from chemicals. And I absolutely agree to the term “magical water”. It actually is. And so today I will be reviewing this product which is my personal favorite and an essential part of my daily skin routine. 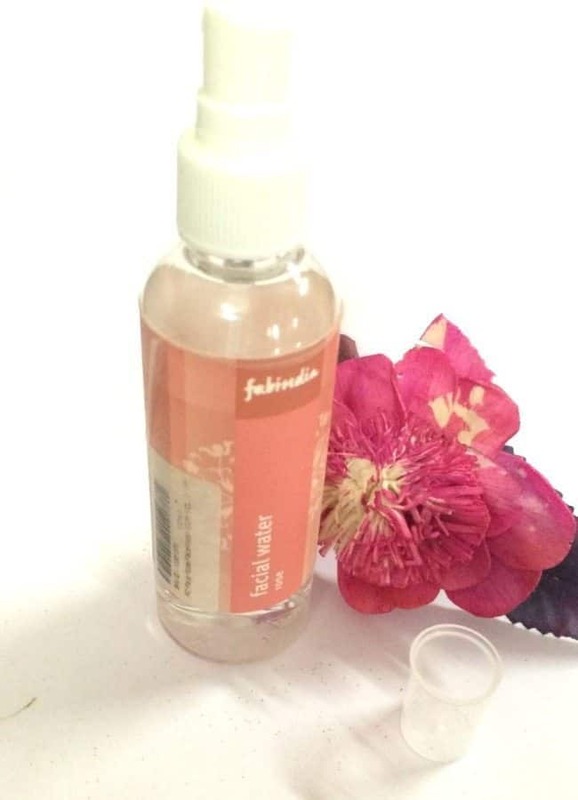 The product is facial rose water of FabIndia. It has no color and is a transparent solution. Fabindia has been in the market from a long time and is one reliable and environment friendly brand and is particularly known for its organic products and provides one of the finest products made without any chemicals. Rose water is popularly known for its toning properties and which is why I picked this product. This product is for girls who are looking for a natural skin toner which is free from any sort of chemicals. 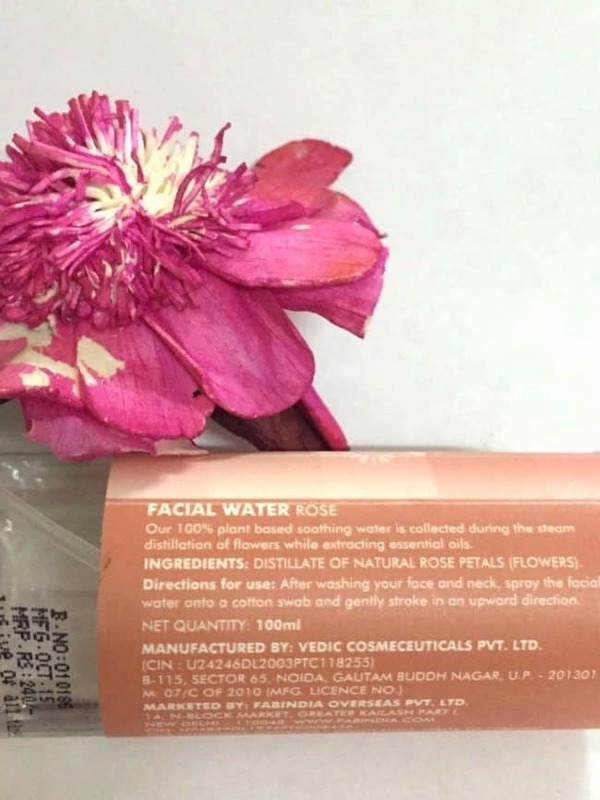 What does the Brand Claim about Fabindia Facial Water Rose? The brand claims is to be a purely natural product free from any chemicals and made by distillation of rose petals and no other ingredient. The brand claims it to be a 100% plant based product. 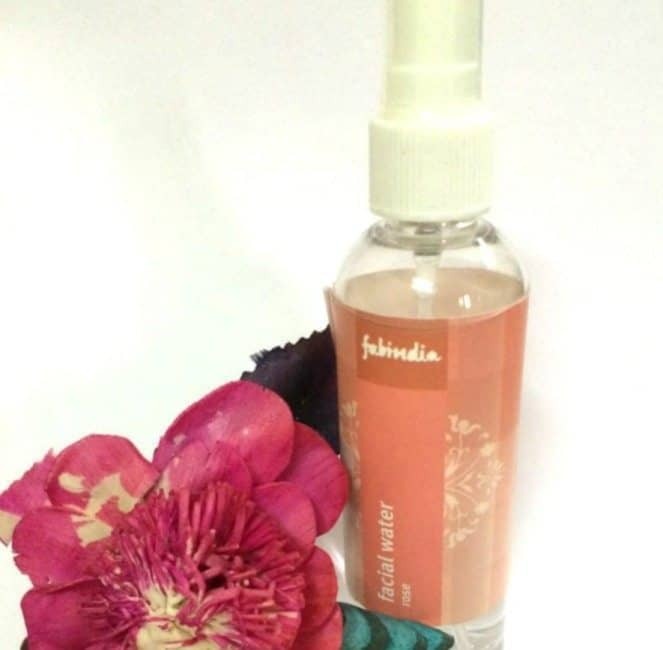 The FabIndia facial rose water comes in a spray bottle. So it is easy to use. You just have to twist open the cap and push the nozzle down to get the rose water out from the sprayer. The bottle itself mentions in the direction that you can directly spray the water over you face evenly but I personally don’t do that. Instead of spraying it directly onto my face I take a clean cotton pad and spray a generous amount of rose water onto it and then apply it on my face in an upward direction. You need not worry if it gets into eyes or you use this product near/under the eye area since its chemical free it will not cause any trouble. However, please make sure you do not apply this anywhere near acne or if you’re breaking out then please avoid application of the product near that area as it might cause irritation and that might deepen your skin problems. I have been using this product for over 2-3 months and I absolutely love this product and this product has become an essential part of my skin care routine. I use this product twice daily, during the day and before going to bed after using my face cleanser. You can use it once, it totally depends on you. This rose water has such a flowery and pleasant rose fragrance that makes you feel fresh also it gives a healthy glow to your face with gradual usage. So to get morning fresh face and to beat the Monday blues or any day blues use this every morning and trust me your face will light up instantly. Apart from giving you a good glow it does have toning properties which will show on your face with time. And it does clean you face and removes dirt and impurities naturally unlike those makeup removers made of chemicals. It makes the skin look fresh, healthy and supple. So for me this is magical and an absolutely natural product. Absolutely natural and free from all sorts of chemicals. Has a flowery and a pleasant fragrance. Tones skins and adds glow to your face. Yes! For sure. Who doesn’t love natural and chemical free products for skin especially your face!